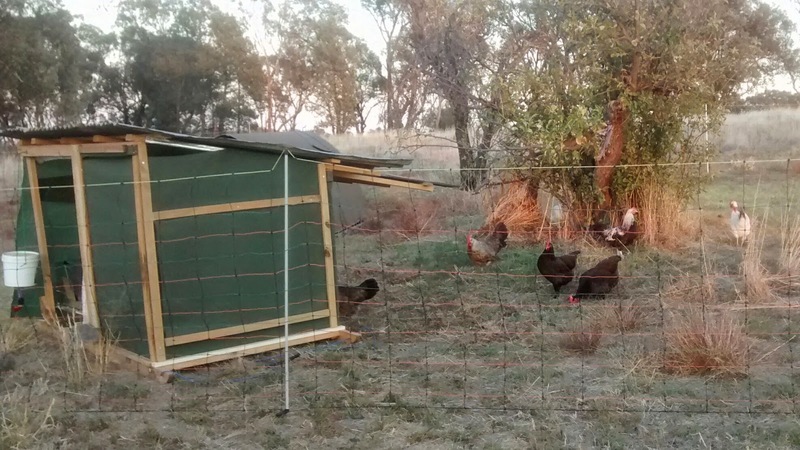 The nesting boxes and feeder house is complete, and just in time for some new additions to the chooky family! The new house is heavy to move, but not impossible for both of us. It's made of wood and canvas, with a corrugated iron roof, and 3 plastic nest boxes for easy cleaning. The domed roosting house is still being used - that's where they sleep each night, and the dorkings still get excited whenever it's moved (even if it's only within their yard, they'll go in, check it out, and cluck excitedly). The new additions! Yes, we went to a poultry auction in Wagga Wagga and picked up a lovely little dorking cockerel that we had asked to be there. His father is from Canberra, and the owner had gone there just to get him. Dorkings are hard to get, and roosters can be an extra challenge. Hopefully he'll grow up big and make lots of little ones of his own some day. We also purchased two langshans after the auction. They are beautiful girls, very shy and sweet. On the way home from the auction, we stopped in at Tootool to talk to a man about chickens we'd promised to collect. They're naked-necks, suppose to be able to cope in the heat much better than fully-feathered chooks. They're settling in fairly well. It's been nearly two weeks since bringing them home and they're starting to mingle as one group finally. The dorkings were not happy about their little trio being invaded, but the new arrivals are all very placid, and certainly not planning a takeover! The weather is starting to cool down here. More of an Autumn feel with the fruit trees starting to loose some leaves. There hasn't been much rain lately, but the water tank is still almost full. Since we don't use much water in the house, we're sharing it a bit with the garden, which is looking a quite sad after the summer heat.